Analog modem support is the latest causality to have been discovered with Apple’s new OS X Lion software. Joining the list with other such as Rosetta and Quicken who have also lost support and features. Apple dropping the analog modem drivers is mainly due to Lion running in 64-bit most of the time, while drivers for older analog modems are still stuck in 32-bit. 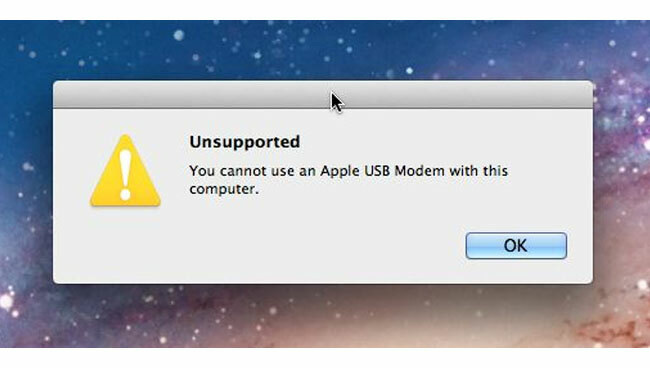 Even if you plug in Apple’s own analog USB modem in to a system running OS X Lion you will receive the message below. Work arounds have been investigated to be able to use 32-bit drivers within a 64-bit environment and booting in 32-bit should help a little. But today who actually needs to use a modem on a daily basis. Sure there might become a time in a far off land where broadband is unavailable but these times are surely becoming less and less, and surely you can’t blame Apple for pulling the plug on older tech within their shine new OS X Lion. For more information on the 32-bit/64-bit dilemma and a few work arounds by modifying system files jump over to the Mac Rumours forums.